Oh No Not Chula Vista closing!!!!!! I used to ride all the way from Phoenix just to skate there once a month. Outstanding floor and mostly good skaters. 95mph on IH-8,750 Ninja. What a blast. RINK CLOSINGs. I promise I will try to keep it short? First of all I am 66 years old,started skating in 1991 and have skated every week at least 2 times ever since. I have been to 94 Different Skate Rinks in the 11 western states. (retired in 2001 and just roam around) I collect a rink info flyer from each rink and will paper the nursing home wall with them one of these days. I have seen what works and helped 3 local rinks do it with much success. (now I know there will be some detractors etc). I moved here because there is 6 rinks in 50 mile radius with turnpikes to get there. FIRST and foremost the rink owners have to MAKE!! good customers! Have some FREE nights for 18 and over only. When you get them there,put your SKATE CATALOGS on the counters,sell anything in the BOOk for costs plus 10%,(10% of something is better than 100% of nothing? )>give free pass 2 for 1 with sale for set time period. You want your people on the best stuff at the least costs. Much more fun and they will be more commited. The Music, 3 fast songs same beat 2 slower songs 3 fast songs again this method all night. THE FLOOR!!!!! You want the good skaters to to able to skate! On the outer edge all around the floor I paint a 4 foot wide line, Faster better skaters here ONLY. When you want to cross over it you hand signal. I know it sounds goofy but the faster rhythm skaters do not have to worry about crashes or constant interruptions etc,you can skate!!!! UN-impeided. Think about skating? First you do not have to think to walk,you just do it. Skating you have to think,plan ahead etc,kinda like riding dirt bike fast in the woods,always looking ahead to allow for evasive manuvers. "Stay out of the high speed lane" if you want to YAK,if you want to break dance,rex dirty dance etc go to the middle of the floor. No standing here,you keep shucking and jiving or move out,and NO cutting thru this center section.Floor control! THE people: I do a thing I call Advancing Couples. I have ever body on skates pick a partner go on the floor. Slow quiet song, after a couple laps I blow whistle and guy moves up to next girl,I do this till everbody meets. Up to them what they do later? Our adult nights have become singles nights where girls and guys show up to not only skate but to meet others. And NO! means NO! if they say No leave them alone,always will have a few hound dogs. Regular sessions friday and sat nights. Owners Please! have 2 sessions,again so you good skaters can come and skate. Second session,NO games,More hip music, just better skaters will attend,tiny tots will be headed for home after 10 etc. This will help pay your bills. Owners!!!!! You need to put pressure on the 4 largest skate manufactures about new and better wheels. The Girls Derby boom has brought many girls (with jobs and husbands with money) back to rink skating along with there derby events. They want good stuff. The big four manufactures are still stuck in the newbie market. Very reluctant to produce quality quad wheels. They ain't listening to us skaters,But they will listen to you the rink owners. And,I am always open to ANY suggustions for improvement from the customers,I encourage it. So lets here some others. Can I get a witness? preach it man, preach it! Skate Country near New Orleans was almost destroyed during Katrina. 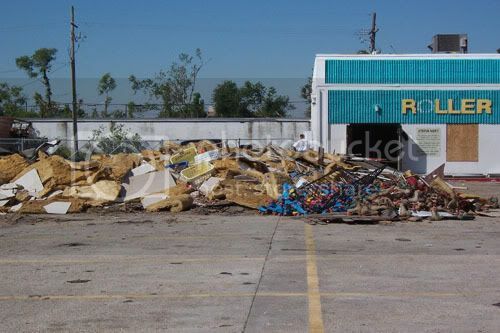 Below are "after Katrina" and "today" shots of Skate Country. In New Orleans, we don't quit and neither should anyone else! For more pictures check out the gallery at the link below. That's so awesome, Betty. It's good to see someone revitalizing a rink, rather than closing it down. This is very definately a cool way to present roller skating. "Owners!!!!! You need to put pressure on the 4 largest skate manufactures about new and better wheels. The Girls Derby boom has brought many girls (with jobs and husbands with money) back to rink skating along with there derby events. They want good stuff. The big four manufactures are still stuck in the newbie market. Very reluctant to produce quality quad wheels. They ain't listening to us skaters,But they will listen to you the rink owners." The manufacturers are starting to listen, little by little. At first, they started manufacturing cheap, colorful crap and marketing it to derby girls as fashion accessories. Then Matter/Answer really stepped up and looked at us as competitive, rabid skaters and made some real innovations (though their products haven't been popular with everyone - I must say, at least they're trying). They've been really helpful in unifying a lot of different communities - they sort of brought some jam and derby communities together, which I think will be essential to rink survival. As far as the rinks, well - I don't have a lot of great experiences. Here in Albuquerque, we've been blackballed by our rink owner - even hockey practices are no contact so there's no way we could practice there. A speed club would be nice, but that's been shut down too. The open sessions here get really packed on the cheaper nights, but I heard that he just shut down the sister rink in El Paso - which probably isn't a good sign for us. And many derby girls have been keeping their business and culture away from rinks because they've been so hostile. You would think that with shrinking attendance and revenue, new skaters would be welcomed with open arms, but it's taken almost six years for people to start welcoming us as part of the bigger rollerskating community - and we still get lots of flak from every angle - though I guess that's just skating. Some people have pointed out that the rink closing would be the best possible thing for us - as it would force all of the complacent roller hockey skaters to start agitating for a public skate surface somewhere to replace the rink. Oh, so many overlapping issues here. I would venture a guess that this rink owner has implemented these rules as a result of the insurance company or to limit liability for the rink. Let's be honest -- hockey with contact and derby both present a real risk of injuries and there are people that will sue the rink rather than accept the responsibility for their decision to participate in those higher risk sports. Maybe the rink owner would allow practice if all of you signed a legal waiver. Problem is, you really have to have a lawyer develop such a waiver and that costs money -- maybe the derby league can absorb this cost? In 1953 or 1954, I taught dance, figures and freestyle in Essex and Lemington Ontario for one day per week each but on The Weekends I coached Speed Skaters at Kingsville On The Lake. It was an outdoor rink that looked like a large oval shaped Gazebo. I believe it was located in a park and there was no charge for admission. not exactely outdoor rink in california, there are many without roofs. golden gate park in san francisco. a rink sized area is dedicated for skating even special pavement to be extra smooth. it is usually 65-70 in the summer and hundreds skate every suunday. when the park is closed to traffic it is called skating place. venice beachin Los Angeles has a similar dedicated skating area. in San Jose we have had several outdoor hockey rink areas. and there is a hockey rink on maui. that is outdoors. New yorks central park has a skating area. that is famous. comunity outdoor skating areas may replace private skating rinks some day. they will keep skating alive where rinks are noy feasible. Bringing this thread back. Are things better or worse than in 2007-8 when this thread existed? Is skating better or worse off? Seems ok unless you want to skate on a monday or wednesday. I think the smaller hometown rinks are still hurting. Same 2 rinks in the New Orleans USA area. I never go to them. Inline skates changed my life. I would consider buying yet another pair of skates if there were a nearby rink to my house. But I am old fashioned and...just...old. Young kids look at me skating in the local park and get excited like they just saw a brontosaurus in a pink tutu. Kids are texting, playing with social media, and team sports. Almost zero young skaters in my area and without the derby girls would only be a handful. Skating rinks and drag racing facilities by nature are generally on the outskirts of town. As the town/city expands and the land prices sky rocket, who can blame rink owners, many near retirement, for grabbing the golden ring while they can. A few rinks in NH (New Hampshire) closed a few years ago. Nashua area and Newington by the Sea Coast, and the one in Rhode Island, yet most of the other rinks are still open and doing OK from what I know. Mass 1,2,3,4,5,6,7 and more are still open, including a tiny one in Worcester, MA. Not sure if Derby which rents rink time helped things out since some of them do their practices and meets, other than in Rinks. I know some of them added Skate Mates and Razor Scooters which to me are nightmares and dangers on the skate floor. Personally I do not see these two dangerous items adding to skate rink volume, only the bottom line since they cost money per time used. 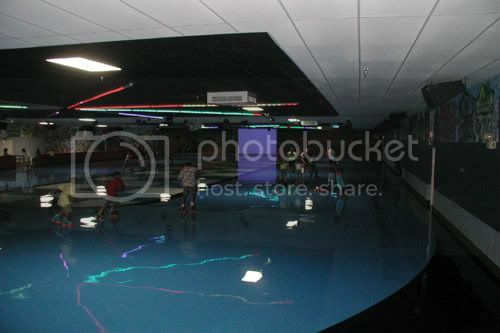 BTW Laser Tag and game rooms has added volume since some come in and never skate. Adult Skating Nights are still stable and I guess one place added one on every other Saturday. Have not been to it yet. SO Thanks for the reminder to check out the times. There are two rinks in my small city of about 60k. Both of them rent out skate mates, which are the bane of my existence. I really do detest those contraptions. Anyway, both rinks do about the same money-wise; the smaller rink does a little less, but well... it's small. For the most part, the people on the north end go to the north rink, and the people on the south end go to the south rink. The really strange thing is that anyone that is around skating enough can tell INSTANTLY which rink is the person's "home" rink by watching him/her skate (like if a north-ender goes to the south rink or vice versa). It's strange in that people from the same town have two very distinct skating styles! Yep, you can tell a "Wall" (owners or Roller Dome family, there are literally hundreds of them) because they drag a big toe wheel after each stroke if they are just toodling around. The development of 83 single-family homes on about 5 acres will cover the former Minton's Lumber site at 905 Los Coches St. and the skating rink at 980 Los Coches St.they sold for 500k+ now selling for 1.1M each. San jose Skate closed 4 years later. It was poorly managed. never could cover the way below market lease of 10k/month. the property was sold and rezoned is now a furniture store. a few new skating option opened. and google owns an outdoor hockey rink that offered a weekly session but that ended when it rains and the lady doing it cancelled it was too much work hauling the sond gear out there every session. for about a year a dance studio offered roller skating but that was sold to linkdin for their offices. Last edited by Bill; August 5th, 2016 at 04:37 PM.